Domestic Moose: I think I'm going to have a UFO weekend. No, I'm not going to Roswell. I'm not even going to Vulcan, Alberta (I wish I were kidding). 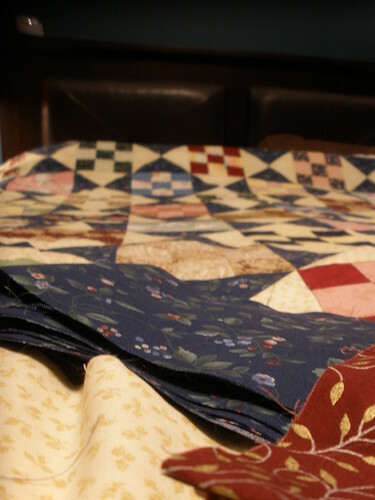 I'm going to my sewing machine to work on some quilt projects that have been laying around far too long. 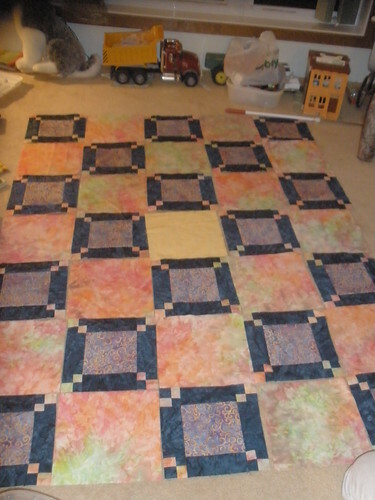 First up is the first quilt I ever started. I'm kinda excited that this weekend will see the binding (isn't it pretty) finally added - red then cream then navy. Then comes the decision I've never actually made before - how to quilt it. Mom knows a couple women who do long arm quilting, I suspect I'll use her recommendation and then hopefully they'll have a suggestion for this busy quilt. Next up on my list of things to finish is a quilt that defines poor fabric choices. Don't get me wrong, the fabric is great and I love each individual fat quarter. However, once put together it's a little hard on the eyes. 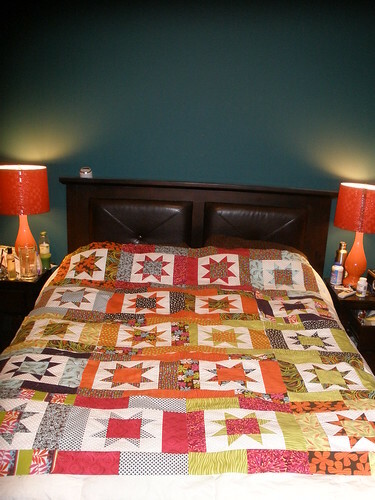 Why yes, that quilt does have pink and orange and lime green in it. And purple too! No. I don't know quite what I was thinking. Finally, we have my favorite quilt. (Yes. I just changed the subject) It could be because it doesn't blind me when I look at it. This one has all the rows ready to be sewn together then appliqued and finally I need to choose a binding for it. 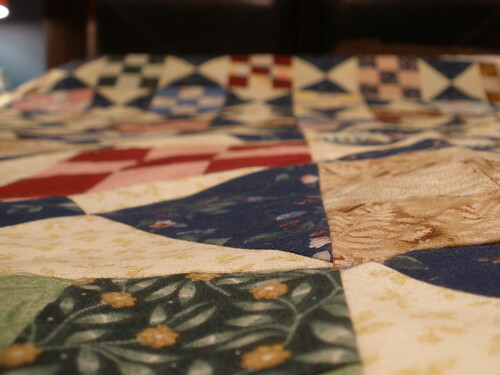 The best part about finishing these three quilt tops? I can buy more fabric. First up will be backing and batting for all of them. And binding because I'm a little dense and didn't buy binding for any of them. Also on the list if I get bored of just sewing, I have fabric to cut up. 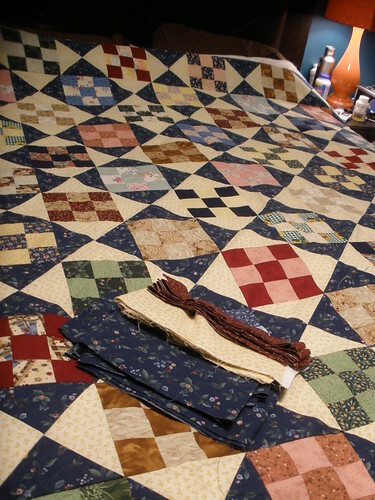 This quilt is kinda special though and it won't get put together this weekend. 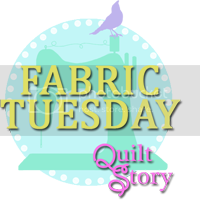 First, the fabric, then the story. That there is some unattractive fabric (particularly that big piece in the second picture). We don't even know what it's supposed to be. There are several theories: roses and butterflies, pineapples or perhaps some kind of alien nut. Regardless, it's going to be used in a quilt. 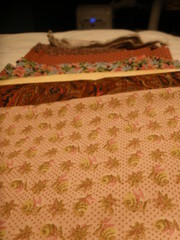 This is all fabric my Mom inherited when her mother-in-law (my grandma) passed away several years ago. In all of the rooting through fabric over the weekend, she decided we needed to do something with some of the fabric from Grandma. 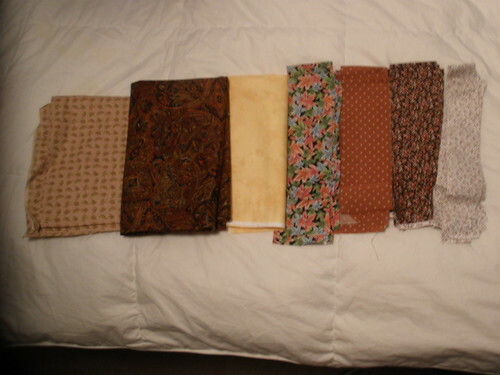 I tried to match them up and this is probably less than half of the fabric available to choose from. I finally came up with this grouping of fabrics that will be used to make a flying geese quilt. The ugly fabric on the end? It's going to be cut into 1.5 inch strips and used as a narrow sashing and border. The dark paisley behind it will be the outer border. Oddly enough, for the pattern I choose, these fabrics were the exact measurement. Mom wants to work on it together so I'll cut all the fabric into strips and over time when we get together, we'll start putting this together bit by bit. Then it's going on my sofa with a flannel backing.